Sea to Summit gear was key for the Waiau-Toa Odyssey adventure film. They are synonymous with lightweight outdoor equipment. Over the last five months, I have used their gear for bike packing, pack rafting, and tramping missions. I was super stoked to have them onboard for Waiau-Toa Odyssey and future missions. Below is a breakdown of the Sea to Summit equipment I used in the Waiau-Toa Odyssey Film, the Escapist 15D tarp, Ultralight Sleeping insulated Mat, Ultra-sil nano dry sacks and the Smartphones TPU guide waterproof case. 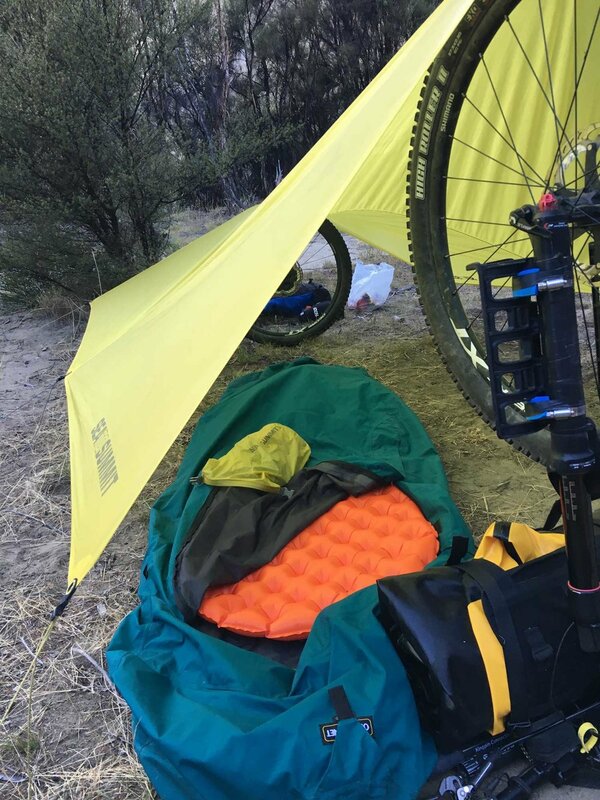 This tarp was a key piece of equipment for my bike rafting trip, super light, compact and very easy to set up using various methods. As you can see below, I used my bike with the tarp laid over the front wheel, and the back wheel removed and turned sideways for the other end of the tarp. Comfortable warm sleeping mats are critical for a good night's sleep. For the thickness and length of this sleeping mat, it is comfortable. I really like the packed down size and weight of the mat, super quick to inflate and pack up. I am 6'2 ish, and I have the small size mat which is plenty long enough for me. This ultralight sleeping mat is insulated which can compensate for a not so warm sleeping bag. Ultra-sil nano dry sacks were a key part of my kit on the Waiau-Toa Odyssey from bags for bike packing to dry sacks for pack rafting. I used the 3L dry sacks combined with salsa HD cages strapping them to down tubes and fork legs. The combination worked well even when charging through multiple creeks, the gear was still dry at the end of the day, an excellent way to distribute gear around my bike. For pack rafting, we use the Alpaca rafts with cargo flies where we can store gear internally. I used two 13 litre nano dry sacks which were super compact when not in use. The combination of these 2 x 13 litres and the 3 x 3 litre dry sacks was ample enough room for all my gear for the pack rafting sections. I have also been using the dry sacks for back country MTB missions to separate out gear, clothing, food and equipment in my backpack, A great way to access equipment quickly and keep everything dry. For me documenting my pack rafting has to be quick and easy, Smartphones TPU Guide Waterproof case has that dialed. I clip it to my PFD via a couple of small carabiners. On river trips, I can take photos without taking the phone out of the waterproof case as there are two clear windows for the camera lens and screen. It was also Really useful to have the phone to access to view topo maps to give a location on long river trips sections. I also use this case on quick MTB rides and trips like old ghost road when the weather gets crappy, darned handy.